Everyone ready for the 4th of July? sun room in her book Carolyn Westbrook Home. for the July 4th Holiday. here are some photos of my sunroom this year. Carolyn had used in her book layout. is my favorite spot in my house. I love to decorate it for the seasons and holidays. as I come to the kitchen for coffee. And now I want to share a few photos of Alaina's. She has the most fabulous house. and a little shed that "thinks it's a cottage". run by and say Hello. and a lot of creativity! Oh, Debra, I think your porch is delightful! We like to spend year round time on our porch too. It definitely reflects a bit of Americana during the summer months, well a lot of Americana. :-) I love having the red, white, and blue out for the summer months. Thanks for sharing these beautiful photos of yours and Carolyn's summer porches. Debra, What a darling sun porch! I love your patriotic collection...especially the wonderful pillow on the wicker love seat. This would be my favorite room too. Happy 4TH! Your sun porch is sweet all decked out in red, white, and blue. Magazine worthy. I have a girl crush on it. I would have coffe out there also. I am making coffee bars now...hehe. Debra, Thank you. You are a dear. I love the red/white/blue in the sun room. I think the wicker couch is my favorite with the flag pillow. I have just tucked in our guests and I am finally sitting down for some me time and what a wonderful surprise. I hope you have a great 4th, we are celebrating my son's birthday. Your sun porch is very inviting. One of the things I miss about my house in the city is the sun porch. I always put a Christmas tree on it covered with Santas on a small dining set I had in it. And I also changed it with the seasons. I do not have a room here that I find as easy to change out. Love your 4th decor. Have a great holiday weekend! Deborah, You are such a sweet dear! Thank you for your well wishes for Hubby. You said you have walked this path? And the results??? Good I hope! Thank you for your kindness, concern, & encouragement during this scary time. I love your 3 seasons porch, our downstairs porch is screened in, which is great, but you still have to worry about rain. Love all the Americana. God Bless America and Happy 4th of July! How beautiful room is, looks just like the picture in the book! Love your bird cages!!! I enjoyed this post very much. You did a great job of recreating the picture. I love to do the same thing. I have a vintage bird cage, too. Mine is painted red, and it's in my sunroom, too. Love your sunroom, Debra! What a great place to sit and have coffee in the morning. Love so many of the elements you've added. First time visitor and loving my visit. Your place is beautiful and God has truly blessed you, yours and the work of your hands and heart. Lovely photos as always! I love your sunroom!! Your porch looks so inviting and I love that you dress it up for the holidays. That is such fun! Your porch is just darling and looks great in red, white and blue. I hope you have a wonderful 4th! My favorite posts are always the ones of your sunroom. Makes me feel like I could just curl up and stay with you forever. It's easy to see that room has your heart. I adore your patriotic spirit! It is red, white and bluetiful. Thank you so very much for your support of Team Laura. Could you email me your address? I'm going to kidnap you one of these days and lock you away in my house ... I'll have you decorate for every holiday and everything in between! You ALWAYS amaze me ; ) .... your 4th decor looks just sparkly!! Have a great weekend ... thanks for the inspiration! 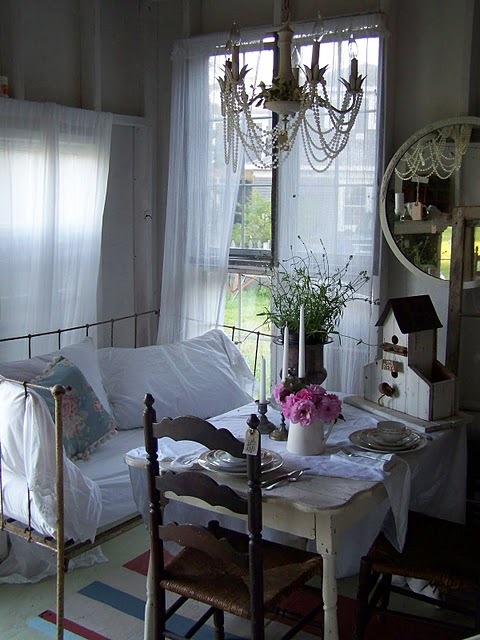 Wonderful Americana Sun Porch, so inviting, what time is lunch? I'll be right there. Thank you for all of the patriotic imagery! You make everything look so beautiful. The toile the florals, the stripes and the flowers are all things that I love. 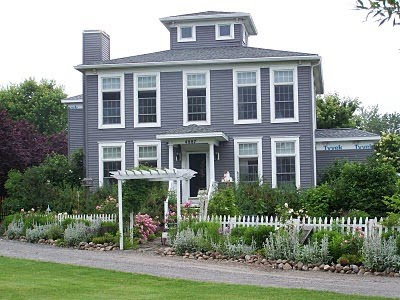 Your decorating style always inspires me to try something new and I am in love with your sweet porch. for your giveway! gorgeous porch- it is amazing how you change it and it always looks fantastic!! Hi Debra! Oh, I'm in love with your sun porch!! I would spend every possible moment here! I love how you've decorated it and the little suitcase with all the pretties in it on the coffee table is precious! Please hurry up & tell everyone how I won that giveaway! I need CW new book. The old one, the one you use for inspiration is completely ragged out, I've read it so many times. The photo of her hutch with all the white ironstone & butter pats on it is my fave! She's genius. So your friend with the slipcovers, she made them?? That is one thing I really wish I could do, make slipcovers. I'd have them everywhere. Your sun porch is gorgeous Debra ~ your effort really paid off. A sunroom like yours is on my wishlist...aaaah someday. Have a wonderful & Happy 4th!!! Your sun porch is always decked out so beautifully! I love your sun porch! It is just so inviting. I have plenty of sun here but no porch. Ha! You have done a great job of putting everything together. 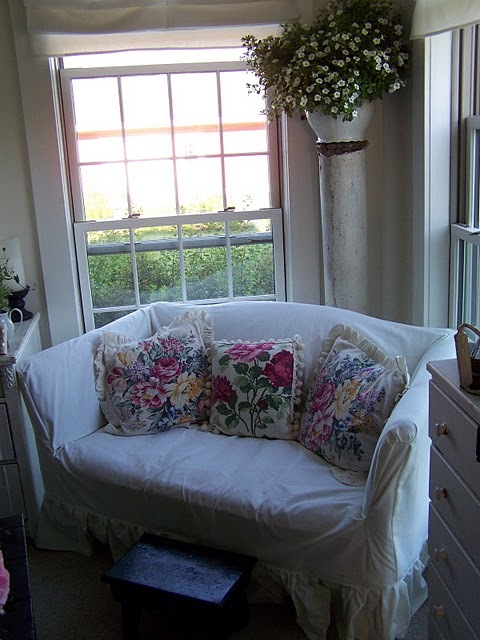 Love the shots of your sunroom....so gorgeous! And yes, very CW like. (I love that book). Debra, I could spend MANY happy hours on your porch! You have the most wonderful collections. Seeing all your flags makes my heart beat red white & blue! Happy Independence Day!